My Portland Rotary Club recently asked if my company could take them through our branding process. They made the job easy. It's been exciting to see a small town influence so many bigger cities as these ideas have been spreading throughout the state. Here's a recap of our efforts. Feel free to use any or all of these for your own Rotary Club. If you have questions, just call. STEP #1: Your brand is the thing people think and say about you when you're not around. Is Your Current Brand Working? Imagine for a minute your organization is a pop-bottle. The words we'd see on your label, that's your brand. But there's a problem. Unless you already know the difference between the Optimists and Rotarians, these labels tell us nothing about each organization's contents. The only way to know what's inside any of these bottles is to open and drink it. We want people to be able to choose Rotary without having to first try out every organization in town. So we change the label to a descriptive tag. Our club is all about: "service" And voila! We stand out from the rest. Once again, we've become indistinct. We know each organization contains very different experiences, but to the public (and potential members/volunteers! ), we all look exactly the same as our competitors. Our club is asked a simple question. How can we stand out? By branding our club on "Service" we were appealing most to people who've already been members for more than 5 years. We were doing very little to attract new or potential members. The question stands, how do we set ourselves apart while appealing most to new members? So we begin to brainstorm, identified our strenths and weaknesses. "What are our strengths?" - "Why do we have them?" - "How do we use them?" Then we brainstorm weaknesses. This is tough. Weaknesses feel private, but this is what makes them so engaging. As the committee brainstorms, a problem emerges. Every time a new idea comes up, each person in the committee has to throw in their 2 cents. No one on the committee is willing to just accept an idea without adding their spin to it. We begin to discuss how this always seems to be a problem for us, not just at the local level but in district and national Rotary meetings too. Then someone says, "managing a Rotary meeting is like herding cats!" And we all laugh... because it's so true!! Why does this resonate? What makes the statement true? We're getting close to our brand essence. Why is managing a Rotary meeting like herding cats?!? Because our Rotary club is made up of owners, executive directors, CEOs, preachers and politicians. We're all used to being the boss! We're used to making the decisions and seeing them adopted quickly. Being the follower and letting someone else make the decision somehow throws us off balance. So what are the benefits of this weakness? #1: ROTARY RAISES MONEY thru an EFFECTIVE NETWORK of COMMUNITY LEADERS. #2: We tend to attract LEADERS. #3: And new members are prioritizing 'NETWORKING' and 'PROFESSIONAL DEVELOPMENT'. We tried the phrase "Leadership Development", but it implies Leadership will be done to you. We want a phrase that implies 'action' instead of 'passiveness'. 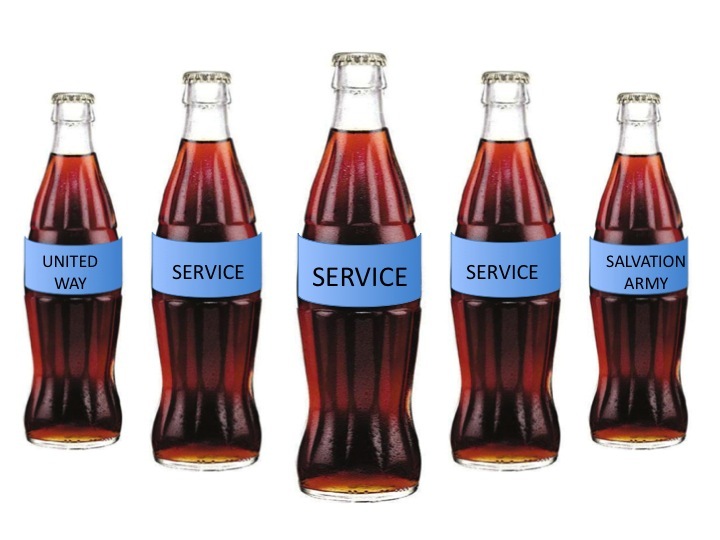 "Servant Leadership" describes us well, but is simply overused. There are 15 different books on Amazon.com with the title "servant leadership". The term is now cliche and seems very unoriginal. Then someone says the words 'LEADERSHIP NETWORK' and everyone in the room feels something simply zing! #4 - DOES THE BRAND WORK? -Rotary's not just an organization. It's a network! -By joining Rotary you can tap a local and global network. -You will spend time with many other leaders. -You will get to learn from and work with them. -A network of leaders will have the power and motivation to get things done. -When you get the feeling it's lonely at the top, Rotary can provide camaraderie with peers. With this new brand, "LEADERSHIP NETWORK", our club is standing out! No other service organization can compete. We're the only Leadership Network in town. Wow! 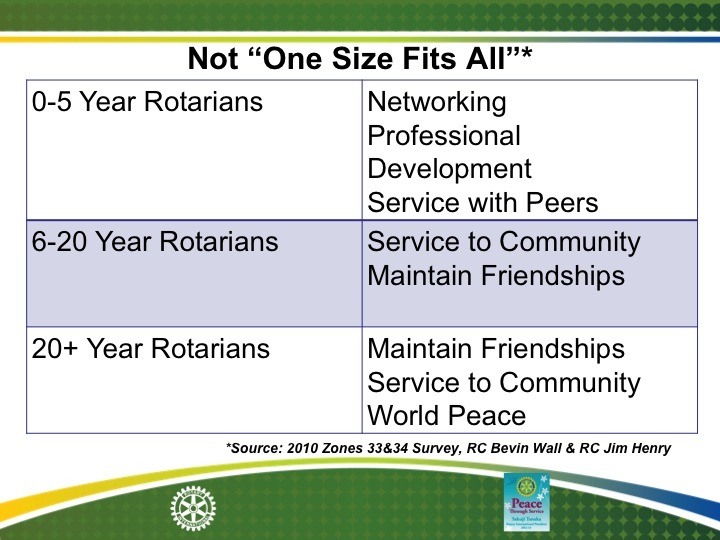 The best part is, it not only fits our club, but fits the history of Rotary International too. Rotary was the first service club, pioneered in Chicago. It's gone on to not only spread around the world but has inspired countless copycats. Rotary also, in its heyday, was known for being the place to be. Its known in most communities as the place movers and shakers go to work together. Of course we can't drop the service altogether. It is our main activity. Service is in our blood. Rotarians will never stop pushing for a better global quality of life. And now we know if we can keep a member in the club for 6 years, 'Service' will become a huge priority in their life as well. Now we have a brand that can attract and keep them interested. You might try these words, "A leadership Network, Working to Serve." For clarification I like to add, "it's like belonging to the best possible country club, but instead of golf, we do service projects." Thanks to those throughout the district who've offered feedback. It's been a joy visiting your clubs and district conferences to share these ideas. The Portland Rotary Club and we here at Thaddeus Rex, Inc. pray it's helpful. Because your feedback is so helpful, we look forward to more. This is what makes a Leadership Network so valuable. To be in a club where smart and motivated people are freely offering constructive feedback is truly priceless. So we look forward to your thoughts. Thank you for allowing us to serve alongside so many of the world's best and brightest. It's an honor!